In mouse school it's very important that students know how to identify a cat -- it's a matter of life or death after all. But when a teacher's lesson on cat identification suddenly turns into a real world dilemma, readers are left wondering, is this really a cat? Few words actually do the storytelling here. The heavy lifting is done with Mike Wohnoutka's adorable and hilarious illustrations. But don't let the scant number of words fool you. If read with conviction and expression, it's the words that will make kids laugh hysterically as they're discerning what's really happening in the story based on the pictures. 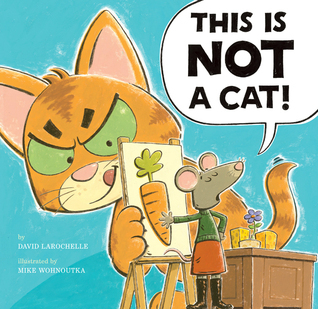 I have a feeling this book will be a very popular read aloud with my students. I'm looking forward to watching their reactions as I read it to them.